Reform of the Indonesian security sector is key to improving respect for human rights and consolidating Indonesia’s transition to democracy. While the Indonesian military has been deprived of its former role as a major political force, it retains an influential role in social, economic and political affairs. It continues to be implicated in serious human rights violations, and alleged perpetrators enjoy impunity for past violations. The use of British equipment to commit horrific abuses against civilians in Indonesia has been well documented. 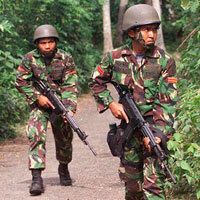 In light of this and continued impunity for security forces, TAPOL opposes the sale of British military equipment to Indonesia, as well as the provision of material and training support to security forces personnel. We continue to call for a ban on the sale of equipment that may be used for internal repression, and challenge the British government on its training of military and police special-forces personnel. As part of our work on Transitional Justice, we support efforts to secure justice for the widespread violations of human rights committed by security forces personnel in Aceh, Timor-Leste, West Papua and elsewhere in Indonesia. We support campaigns for military personnel to be tried in civil rather than military tribunals, and advocate the closure of military business interests, which are frequently linked to human rights abuses.